The girls on the beach are all within reach if you know what to do...go on a retro-fitted vacation every time you check this Clock! 8" diameter plastic Clock with glass lens & aluminum hands. AA battery (not included). 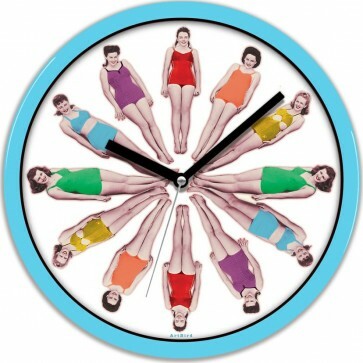 The girls on the beach are all within reach if you know what to do...go on a retro-fitted vacation every time you check this Clock! 8" diameter plastic Clock with glass lens and aluminum sweep hand runs on a single AA battery (not included) and is guaranteed use for one year.